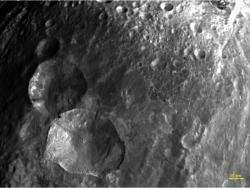 A set of three craters, nicknamed "Snowman," are seen in this image of the northern hemisphere of Vesta. This image was obtained by the framing camera on NASA's Dawn spacecraft on July 24, 2011 from a distance of about 3,200 miles (5,200 kilometers). Join in and write your own page! It's easy to do. How? Simply click here to return to Astro Photos.